James Milner has revealed what was going through his mind as he waited to take a crucial late penalty against Fulham. Liverpool were given the lead by Sadio Mane in the first half of Sunday’s game at Craven Cottage, but former Red Ryan Babel pegged them back by taking advantage of a mix-up between Alisson Becker and Virgil van Dijk. Jürgen Klopp’s side then had 14 minutes in which to conjure a winning goal to take them back to the top of the Premier League. 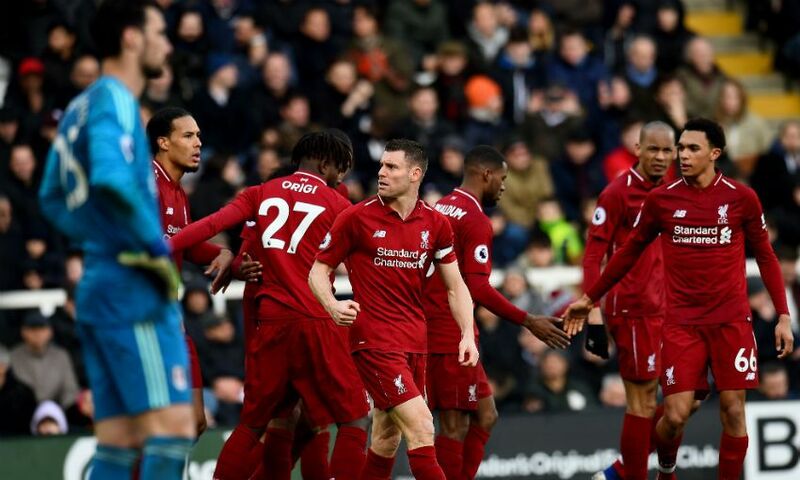 They would need just five to do so as Milner, coolness personified, slotted his spot-kick down the middle in front of the away end after Fulham goalkeeper Sergio Rico had fouled Mane. Speaking post-match, the vice-captain took partial responsibility for Babel’s equaliser before explaining his thought process after referee Craig Pawson had awarded the penalty. “It was me who put him [Van Dijk] in the mire, to be fair!” Milner told Sky Sports. “The gaffer said ‘come on and calm it down’, so the best thing to do is to slice it over the top and put Virg under pressure, which wasn’t ideal! But luckily enough we got the result and did what we needed to do.